CMI China Pro 1LB On Sale! Dietary supplement. The amazing super food. Cold fracture process. Better than chia seed and ground. 100% Natural. Better than flax. Better than fiber. High in protein. High in omega 3's. Fiber, protein, omega 3, anti-oxidants. Chia Pro is the absolute perfect super food. Chia Pro is produced using the revolutionary all new CokJ Fracture Process (CFP). This unique process enables the seed to be fractured into 4 or more parts with no loss in yield or nutrients. Many of the benefits of this mineral rich LT945 Salvia hispanica L seed are derived from the pristine and stable properties of the 30 to 35% oil content and the beneficial interaction of the oil with its naturally occurring minerals. The Cold Fractured seed allows certain enzymes to be released and nutrients to be activated that increase the bioavailability. Chia Pro captures all of the nutrients, protein, Omega 3 Oils, Fiber, and Anti-Oxidants by fracturing the seed. The result. » a completely bio-available versatile flour, more valuable and nutritious than any seed. For best results, try these recipes. Add Chia Pro to jams, jellies, shakes, smoothies, hot and cold cereals, yogurt, ketchup, sauces, breads, cakes, etc. When baking, use 30% less than regular flour. Benefits of Chia. Nature's richest vegetarian source of omega-3 essential fatty acids. Nature's richest source of fiber (especially rich in soluble fiber). Complete protein with high levels of 18 Amino Acids (including the essential 10). 3x More iron than spinach. 15x More magnesium than broccoli. 6x More calcium than milk. 15x More Omega 3's than salmon. 4x More protein than kidney beans. 2x More fiber than bran flakes. No trans fats. Gluten Free. Hypo-allergenic - There are no known allergies to Chia Pro. Chia seed has higher levels of alpha-linolenic acid (ALA) than flax seed. ALA is an essential acid because it is not produced by the body. 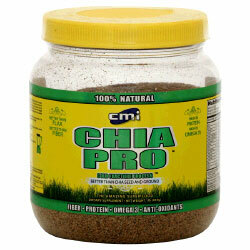 In fact, Chia Pro has the highest known whole-food source levels of Omega-3 acids, as measured by percent of weight. » Compared to other seeds and grains, Chia Pro provides the highest percentage of complete protein, averaging between 21% and 22% protein, with 18 amino acids. Unlike many vegetarian sources of protein. Chia Pro has adequate levels of lysine and trytophan, with good levels of phenylalanine and glycine, and high levels of arginine, glutamic acid and aspartic acid. Ingredients: Other Ingredients: ChiaPro Partially Defatted F3(LT945 Salvia Hispanica L.) Flour. Suggested use: As a dietary supplement, adults mix two (2) tablespoons into 8 oz. or more of your favorite liquid. Stir until mixed. May use one (1) to three (3) times daily. Do not use in carbonated beverages. For best results drink ample amounts of water Store in a cool, dry place away from direct sunlight. Keep out of reach of children.